What can be more disagreeable than putting on a pair of wet shoes in the morning ? It’s uncomfortable and unhygienic ! The shoe drier is the perfect solution. 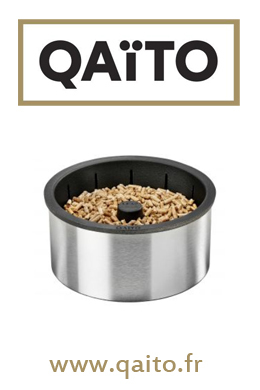 It dries dampness and perspiration by simple ventilation, without heating. In all domains, it provides comfort and hygiene while protecting your shoes. Due to perspiration, rain or snow, shoes worn all day are damp when taken off in the evening, whatever the season. 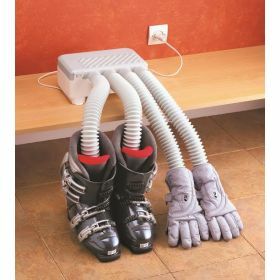 Put your shoes into the shoe drier and insert one of the flexible blower tubes into each shoe. You will have the pleasure of finding them perfectly dry and in good condition the following morning. The shoe drier ventilates air at room temperature, it does not heat. The shoes are therefore not seared by heat, do not shrink and remain flexible. 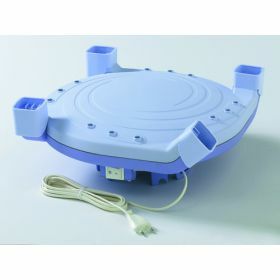 The electric shoe drier can be fitted against a wall using only two screws (included), near an electric socket ; it can also be simply placed on a shelf or in a cupboard. By using the device regularly, the leather will not have time to become permeated with dampness and will therefore not release unpleasant odours. This appliance may be used for all types of shoes, boots, gloves and sports footwear made of any material. Its operational cost is insignificant, since it consumes very little electricity (18 Watt).